Gastric subepithelial lesions are frequent incidental findings on upper endoscopy, and potentially-malignant lesions warrant surgical resection. The laparoscopic approach to many surgical procedures is associated with less pain and organ dysfunction than open surgery. Similarly, enhanced peri-operative recovery programmes (so-called “fast-track” methodology) have also led to reduced morbidity and shorter hospital stays. The combined use of these approaches has the potential to reduce perioperative morbidity, however this is poorly investigated in gastric surgery. 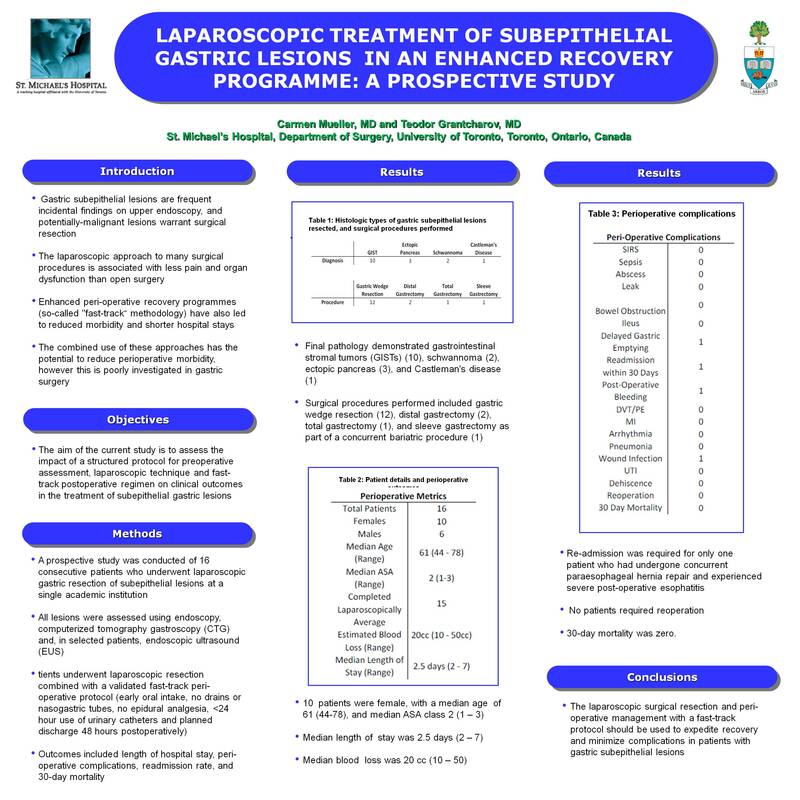 The aim of the current study is to assess the impact of a structured protocol for preoperative assessment, laparoscopic technique and fast-track postoperative regimen on clinical outcomes in the treatment of subepithelial gastric lesions. A prospective study was conducted of 16 consecutive patients (10 female, median age 61 (44-78), median ASA class 2 (1-3), who underwent laparoscopic gastric resection of subepithelial lesions at a single academic institution. All lesions were assessed using endoscopy, computerized tomography gastroscopy (CTG) and, in selected patients, endoscopic ultrasound (EUS). Vascular mapping and lesion localization by CTG was used to plan surgical resection, and patients underwent laparoscopic resection combined with a validated fast-track peri-operative protocol (early oral intake, no drains or nasogastric tubes, no epidural analgesia, <24 hour use of urinary catheters and planned discharge 48 hours postoperatively). Outcomes included length of hospital stay, peri-operative complications, readmission rate, and 30-day mortality. For surgical planning, the surgeon rated CTG imaging extremely useful for localizing laparoscopically-invisible tumors, assessing the anatomical relations to the esophagogastric junction or pylorus, and planning localized versus extensive resection. Final pathology demonstrated gastrointestinal stromal tumors (GISTs) (10), schwannoma (2), ectopic pancreas (3), and Castleman’s disease (1). Surgical procedures performed included gastric wedge resection (12), distal gastrectomy (2), total gastrectomy (1), and sleeve gastrectomy as part of a concurrent bariatric procedure (1). The median length of stay was 2.5 days (2-7). Re-admission was required for only one patient who had undergone concurrent paraesophageal hernia repair and experienced severe post-operative esophatitis. No patients required reoperation and 30-day mortality was zero. Laparoscopic surgical resection and peri-operative management with a fast-track protocol should be used to expedite recovery and minimize complications in patients with gastric subepithelial lesions.